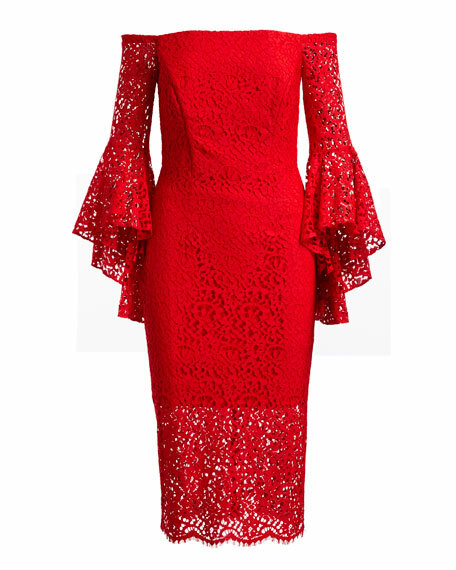 Milly "Selena" lace cocktail dress. Approx. 42"L down center back. For in-store inquiries, use sku #2298084. Alexis "Kieran" cocktail dress in lace with ruffle trim. Square neckline. Thin shoulder straps. Body-conscious silhouette. Floor-length hem. Concealed back zip. Nylon/cotton; combo nylon/spandex. Polyester/spandex lining. Imported. Model's measurements: Height 5'10"/177cm, bust 31"/79cm, waist 24"/61cm, hips 34"/86cm, dress size US 2. Cushnie cocktail dress in power viscose. Off-the-shoulder neckline, highlighted by curved sweetheart panels. Long sleeves. Pencil silhouette. Hidden back zip. Cushnie cocktail dress in power viscose. Off-the-shoulder neckline, highlighted by curved sweetheart panels. Long sleeves. Pencil silhouette. Hidden back zip. Midi length. Viscose/nylon/spandex. Lining, nylon/spandex. Made in USA of Italian materials. Model's measurements: Height 5'11"/180cm, bust 32"/81cm, waist 24"/61cm, hips 35"/89cm, dress size US 2. CUSHNIE cocktail dress in light power-stretch jersey with asymmetric charmeuse detail. One-shoulder neckline. Sleeveless; geometric cut in detail. Bodycon silhouette. CUSHNIE cocktail dress in light power-stretch jersey with asymmetric charmeuse detail. One-shoulder neckline. Sleeveless; geometric cut in detail. Bodycon silhouette. Back zip and vent. Midi length. Viscose/nylon/spandex. Lining, nylon/spandex. Made in USA of imported material.